Modern Kids Bedroom Sets by SouthShore for Cheap! Get your kids a super modern kids bedroom furniture set by SouthShore for cheap! 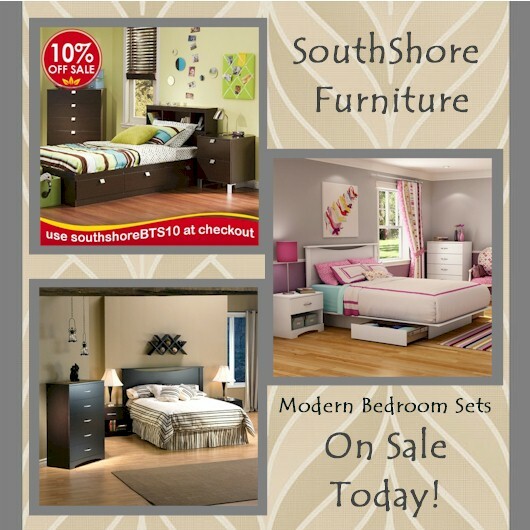 That’s right, SouthShore furniture sets are on sale right now for 10% off. These sets are so beautiful and well-made that you’ll want one for your room too and luckily at these prices you can afford it! See some of their gorgeous bedroom sets below to get an idea of the stylish collections SouthShore offers and if you like what you see visit us today to view all the SouthShore Furniture collections. 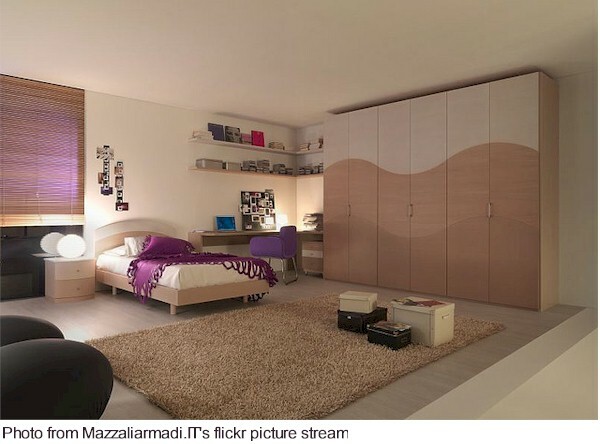 As you can see in the picture below, less can be more when it comes to kids modern bedroom design. In the picture the decorator has used simple kids furniture in neutral colors combined with splashes of purple on the window, bed and chair to create a truly contemporary space. The doors to the storage area have been painted with a basic, yet flowing design to continue the modern and tranquil feel that’s throughout the rest of the room. It would be pretty easy to recreate this gorgeous, modern bedroom decor. First thing you would need is a simple, yet modern kids bedroom set like the furniture sets in the SouthShore Back Bay Collection and South Shore Step One Collections below. Once you get the kids furniture, have a pow-wow with your teen and together decide on a neutral paint color for the walls, pick a deeper or lighter tone for the rug and choose which bold accent color you will incorporate in the window valance, bedding and free standing chair. If you want to utilize the flowing design from the storage space in the first picture, you could paint it on one wall if you don’t have that identical storage unit. The wave-like design can include the wall color and rug color, so everything flows nicely. Once you decide on colors the rest is easy. Hit the stores and find items that meet your color choices then add everything to the space to create that contemporary kids bedroom decor. 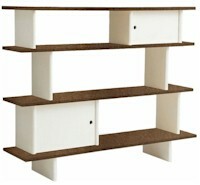 To check out all of our modern kids bedroom sets visit us today at SimplyKidsFurniture.com. If a modern look is what you’re after for your child’s room, you’ll love the kids furniture storage pieces that you’re about to see! From cabinets to shelving, there are great options out there for those looking for storage units with updated designs. The Classic Collection Mini-Library in Walnut by Oeuf is a truly stunning piece that defines high-end, modern design. With open shelving and cabinetry, you’ll have lots of options for storing your child’s books, accessories and much more. The staggered shelf widths give this piece a one-of-a-kind look you’ll love. Powell Furniture Monster Bedroom Mobile Storage Unit will take any space from drab to fab in an instant! The industrial, modernized look of this cabinet will be perfect in a younger or older child’s bedroom. 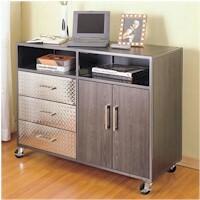 With a gray steel finish and heavy, locker room style metal drawers, this piece is perfect as a media cabinet or bureau. 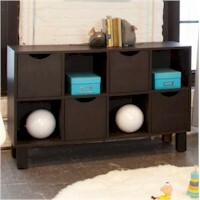 Bratt Decor Blu Cubby in Mocha adds a cool vibe to any space. This storage unit is modern and modular with its simplistic mix of sliding drawers and open spaces within each cubby. Clean lines and an even finish make this piece an eye-catching addition to a child or teen’s room, perfect for storing toys and accessories.